Basically a repeat of what was posted earlier. Support Allies with a Link Monster, And Crush Your Opponent With New Synchro Tactics! • When you Normal Summon “Shiranui Spearitualist”, you can Special Summon 1 “Shiranui Spectralsword” monster from the hand or Deck! Since “Shiranui Spectralsword” monsters are Tuners, you can follow up with the Summon of a powerful Synchro Monster! • “Shiranui Spectralsword of Sunset” can Tribute itself to Special Summon 2 of your banished Zombies, including a “Shiranui” besides itself, in Defense Position. The monsters Special Summoned by this effect have their effects negated, but they’re perfectly set up to be used for Link or Synchro Summon! Since many “Shiranui” monsters have effects that activate when banished, this effect can make use of those banished cards! • The Synchro Monster “Shiranui Spiritsaga” can banish a monster face-up on your field or from your banished monster to activate its effect! Depending on the choice monster banished, you can use the banished monster based on the situation! • “Shiranui Splendidsaga” is a Zombie Link Monster, which while in your Monster Zone, Synchro Monsters on your field cannot be destroyed by effects, and FIRE monsters you control cannot be destroyed by battle! Also, its third effect, during your opponent’s turn, lets you Special Summon 1 of your banished Zombie Synchro Monsters to a Zone Splendidsaga points to! Special Summon Zombie Synchro Monsters banished by the effects of cards like “Shiranui Spiritsaga”, et al! 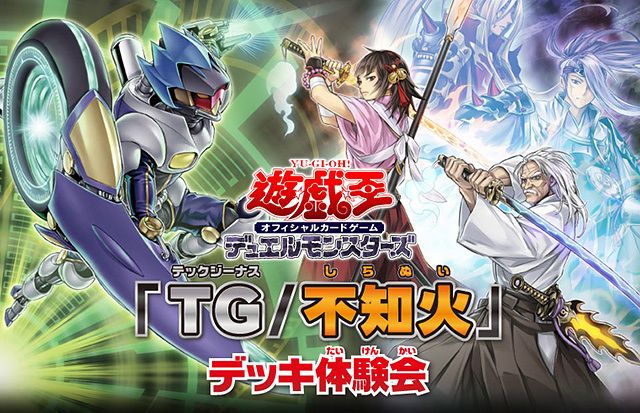 Make use of a new power to further Synchro Summon “T.G.” monsters!! • “T.G. Screw Serpent” can Specual Summon a Level 4 or lower “T.G.” Monster from the GY if it’s Normal or Special Summoned! Using this effect, you can follow up with a Link or Synchro Summon! • If “T.G. Star Guardian” is Special Summoned, it can add a “T.G.” monster from the GY to your hand! Also, its 2nd effect can Special Summon 1 “T.G.” monster from your hand, allowing you to Special Summon the monster you added to your hand with its first effect! By gathering “T.G.” monsters on the field, you can make further plays! • “T.G. Trident Launcher” is a Link 3 “T.G.” Link Monster! By activating the effect of a “Crystron Glassfiber” you Link Summon, you can Special Summon “T.G. Tank Larva” from your Deck, and then follow up by Link Summoning “T.G. Trident Launcher”! When you Link Summon “T.G. Trident Launcher”, you can use its powerful effect to Special Summon 1 “T.G.” monster from the hand, Deck and GY each! And, since “T.G.” Synchro Monsters this card points to cannot be targeted by your opponent’s effects, use the monsters Special Summoned by its first effect to Synchro Summon!